A headteacher has apologised after a secondary school showed a “racist” Two Ronnies sketch to parents. The clip, titled “The Sheikh in the Grocery Store”, was played at a parents’ information evening at Archway School in Stroud, Gloucestershire. The 1985 sketch features Ronnie Corbett, wearing dark makeup and an Arabic keffiyeh, mispronouncing the names of items on his shopping list. Corbett’s character tries to buy a series of items off a shopping list, mispronouncing words including “chocolate mousse” and “tomato puree”. 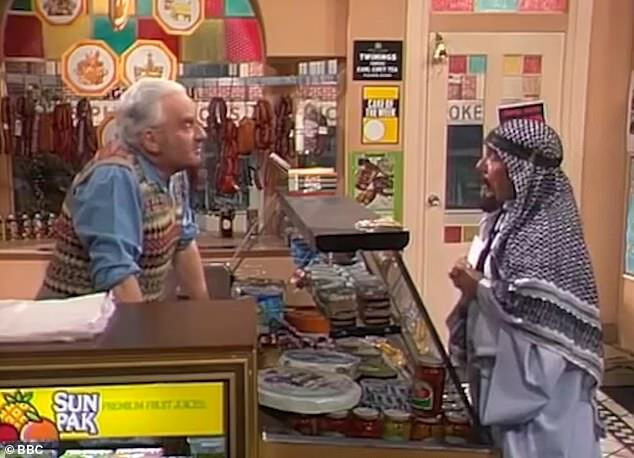 Barker’s shopkeeper initially misunderstands and then tries to correct Corbett’s character, but he swiftly mimics the flawed pronunciations when the frustrated sheikh placed a pile of cash on the counter. The school said the five-minute sketch had been played at year 9 information evening to illustrate the importance of communication between parents and teachers. Several parents complained it was offensive. One, who asked to remain anonymous, said: “A teacher giving the presentation said the clips would show us how important communication is, but we couldn’t believe it when it when it came on the screen. The school’s headteacher, Colin Belford, said he personally contacted parents to apologise for the “inappropriate choice” of clip. Mr Belford said: “I was contacted by some parents following a year 9 information evening last week. “They were understandably and justifiably concerned and offended by a YouTube clip which was used on the evening. “The clip was of a Two Ronnies sketch from the 1970s – the intention had been to demonstrate communication difficulties. “I have spoken to each of the parents who contacted me to apologise for this inappropriate choice. “I am grateful that they recognised that this is neither typical of Archway nor its inclusivity. The sketch also features racial slurs including “Chinaman” – Corbett’s character’s mispronunciation of “cinnamon”. A 2016 study by broadcasting regulator Ofcom found modern-day television and radio audiences were less tolerant of racist or discriminatory words than ever before. The research found context was important, with viewers more likely to accept offensive language in realistic situations. Tony Close, director of content standards at Ofcom, said at the time: “People draw the line at racist and discriminatory language – participants felt this was the most unacceptable of all. In 2014, departing Ofcom chief Ed Richards said some 1970s comedies could longer be shown because modern-day viewers found them offensive. He told The Independent: “[There are] comedies from the Seventies which had certain racial stereotypes in them which are unimaginable today and if they were shown people would find them offensive and that wouldn’t just be people from black and ethnic minority communities, it would be everybody.